Efficiency and versatility are what the 21st century is all about. The building and construction industry capitalises on those aspects due to the amount of time it takes to complete a single project and the huge costs of building supplies. The use of hooklifts is part of this. A Hooklift is a heavy-duty collection and transportation device used for grabbing and lifting loads by means of a device such as a hoist or crane. They are utilised for various purposes. In waste management, hooklifts are trucks with mounted hydraulic hoists that contain skip bins designed to transport materials such as simple wastes, demolition and industry wastes, scrap materials, and other recyclable materials. Although hooklifts can be quite useful for waste removal in Newcastle, they are not exclusive to skip bins. They are also widely used in construction. What makes hooklifts a practical choice? There are a number of reasons why you should hire a hooklift from a waste removal Newcastle company like Skip the Tip for your project. Some screwdrivers have features wherein you can change the tip to suit your needs. You can pick Phillips or a slotted head, or whichever one you need. Hooklifts work in a similar way as they can be configured depending on your needs. All you have to do is to simply change the type of container and, voila, a new device. For example, construction and landscaping utilises a flatbed container with a hook hoist as a utility truck to haul lumber, blocks, or machinery. Haulers and demolition operators can load large skip bins to transport debris or for waste removal. These trucks can even attach mobile concrete mixers for the construction of roads and other infrastructure. Talk about flexibility! Because hooklifts are so versatile, they increase efficiency and productivity in construction. Hooklift trucks can switch their attachments quite quickly. That is why it is more efficient to hire skip bin hooklifts than calling around to locate a number of different trucks for different purposes. For example, a city is repairing streets. The first day may only consist of demolishing existing cement and asphalt to flatten the street. Now, the hooklift you’ll hire will be used as a skip bin to transport the asphalt and cement debris to waste. On the next day, the skip bins could be used to transport cement or the hooklift can be entirely changed into a concrete mixer. Since it is quite easy to change attachments, you may go from pouring concrete one day to managing waste in another. Hooklifts are perfect for an industry that often works with a tight schedule. If you are the type that doesn’t want any minute gone to waste, then by all means, hire a hooklift. Essentially, the construction industry targets cost efficient solutions that won’t impact the quality of job. Hooklifts are generally budget-friendly as they are affordable whether you hire one or buy one. 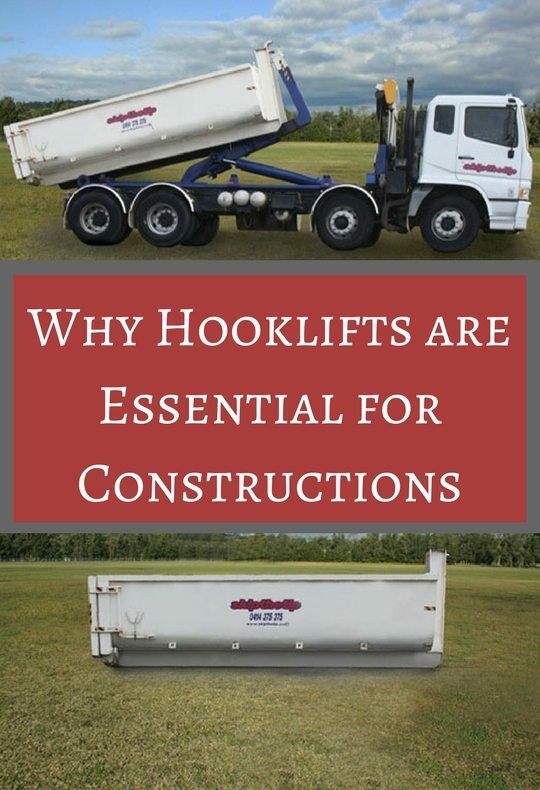 Hiring a hooklift allows one truck to be enough to address your needs. By this, you eliminate the need to purchase multiple trucks. A single truck, a single license, and a single driver; this reduces the operating expense, while expanding the services. Not only does it save money by lowering the up-front costs of purchasing more trucks; it also saves money because each truck owned is used more efficiently. Hooklifts have been proven to be as versatile as a chameleon to your ever-changing and expanding needs. Hiring one may be the most cost-effective business decision for your construction. Whether it’s a small house renovation or a large infrastructure construction, there is always a need for the transportation of materials and waste removal. Skip the Tip is Newcastle’s one stop shop for hooklifts and skip bins for hire. We can help you solve your logistic problems by providing you affordable and efficient skip bins for hire. You can contact us for enquiries and to get an obligation-free quote.